The sensation of warm sand between the toes. The coolness of grass beneath bare feet. The pain as a 1-inch thorn pierces my flesh after penetrating the thin sole of a minimalist shoe… I’ve experienced all of these sensations recently, and like all of life’s events it has provided an interesting tangent upon which to contemplate music. I conduct orchestras for a living. The amount of time I actually spend conducting is relatively small, however. Depending on the orchestra, I spend only a few hours each week rehearsing or performing, and even less time bowing to an audience. Rather, I spend most of my musical time alone, studying orchestral scores and pondering rehearsal strategies. Conductors begin the process early, as the only ensemble musicians with all of the information in front of them. The conductor’s score contains every player’s part, notated so that they can be read at the same time. (If I’d get my feet out of the way above, you might be able to see that from the photo). By contrast, an orchestral player’s sheet music contains only their individual part. It may have some clues as to what others are doing, called cues, but usually they only see their own notes, rests, articulations, etc. Like a member of some secret club, the conductor seems to have all of the passwords, secret signs, handshakes and symbolism to relate each part to the whole. But rather than esoteric knowledge, the score represents the conductor’s responsibility. My task is to increase the awareness of how the parts represent the whole. Seriously though, the arm waving is important. As part of a language of gesture, it communicates to the other musicians the tempo, pulse, phrasing, dynamics (loud/soft), articulation (length of notes), and other elements of the music. It helps each part relate to the others. It is an overwhelming task if you stop and think about it. Besides that, the conductor is charged with presenting a unified interpretation. The challenge of encouraging 90 musicians to play music together with the same intent is daunting. If the conductor falls into the trap of telling the musicians that he somehow knows better, or is better, then a classic dysfunctional relationship has emerged—the Classical Dysfunctional Relationship, perhaps. So, where do my feet figure into all of this? I’ve been fascinated by the barefoot and minimalist shoe fad. This has enabled people to experience something taken for granted in a new and holistic way, walking and running. We’ve learned that the mechanics of the foot is important. The feel of the ground is important. The transmission of sensation through the foot to the body may be something we have been missing for generations. It is important to the entire body, mind and spirit, and experiencing it can affect our lives. I propose that we think of the conductor and orchestra differently. Too often we think of the conductor as the head of the orchestral body—the mind and brains. What if we conceive of the conductor as the feet of the ensemble? Consider a concept of music coming from the ground up, so to speak. The sensation of the ground, the composer’s score, is translated through the sensations of the conductor to the orchestra, the vital parts of the body, interrelated and interactive. The orchestral body may experience greater freedom to play and engage in a holistic music making rather than being directed from above. In my experience, musicians have more meaningful experiences and audiences have more genuine responses when music is produced in this way. 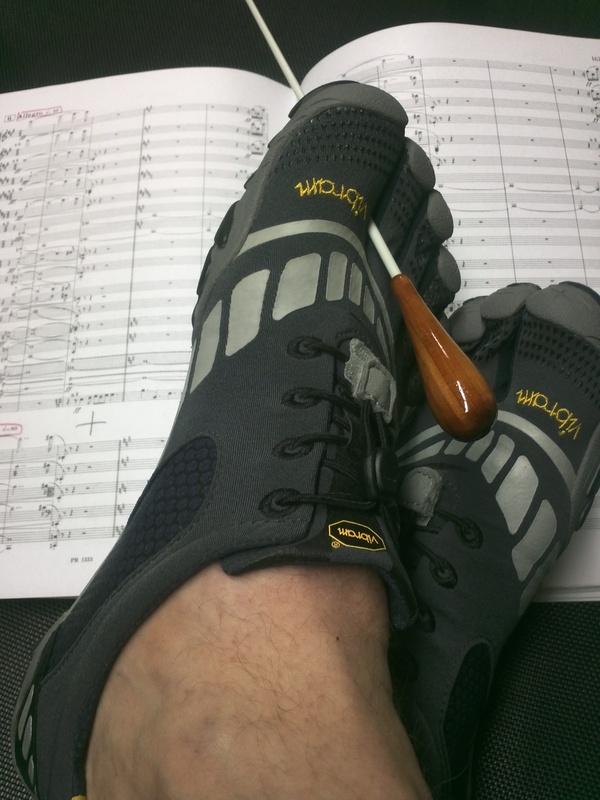 I don’t have plans to conduct an orchestra barefoot, not even with my spiffy new Five Finger shoes. Rather, my new experiences and study have prodded me to strip this down to the bare essentials. I plan future entries in this thread that will deal with the nuts and bolts of music, and how we can distill the essence of music by viewing it from this new angle. It is my hope that it will be applicable to all musicians, not just us silent, arm waving types. Now, take of your shoes and sit a spell! The concert is about to begin. *Bonus points to those who noticed that Bugs Bunny was not wearing shoes in the video! My ancestors came to America from Poland, Scotland, England and Sweden. Long before that, a sweeping series of migrations brought some of them into Europe from the Steppes of Asia, and perhaps as far away as Siberia and India. So when I explain my “European roots,” I often wonder what that really means. And similarly, what does it mean for the orchestral music that I conduct? Music does not, and cannot, exist in a vacuum. The ever-evolving art of music has always been beholden to what has come before, and who was knocking on the door, so to speak. The musical slice of culture—composers, performers, and instrument makers—perpetually soak up and incorporate what they experience. Change in music is as inevitable as the evolution of cuisine after the introduction of a new spice. I was fascinated with these connections as a young musician. I even dropped out of the classical scene for a while to study ethnomusicology in graduate school. While my dreams of studying m’bira music in Africa didn’t quite work out, I maintain a keen interest in the music of other cultures and how interconnected music can be terms of history and culture. The violin family can be traced to a medieval instrument called the rebec, which is most likely derived from the Arabic rebab that entered Europe in the Middle Ages. 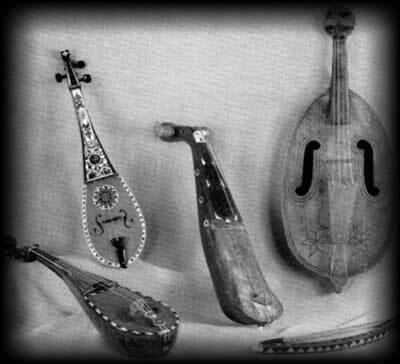 The “other” dominant family of bowed strings, the viols (violas da gamba) evolved from flat-backed plucked instruments (proto-guitars), brought into Spain by the Moors. The banjo originated in sub-Saharan Africa, brought to America on slave ships. Bluegrass, Dixieland and early forms of jazz all utilize the banjo, and the physical instrument and technique changed to accommodate the needs of each individual style. Almost all percussion instruments in today’s orchestra and band originated in Africa, Asia or the indigenous Americas. Mozart’s addition of cymbals, triangle and bass drum in selected works demonstrates the assimilation of culture. The Ottoman Turks used those instruments as part of the Janissary Bands that accompanied their troops. Despite the hostile invasion, the Viennese fell in love with the musical sounds (as well as Turkish coffee!). What this means for today’s musician is that we have a fascinating legacy of world connections. This is described beautifully in the 2008 documentary with Bela Fleck, Throw Down Your Heart. In the film, Mr. Fleck travels to Africa to discover the roots of both the banjo and his music. (The entire film is currently available on Netflix—highly recommended). Perhaps the best example of inverted music history is Yo-Yo Ma’s work with the Silk Road Project. This ensemble has preserved traditional music while also encouraging new works and explorations. An exciting reimagining of music takes place with these musicians, who draw upon traditions of many different cultures. Their music encourages us to open our eyes by creating music that can affect us deeply. This knowledge and search for roots does nothing to cheapen the art of existing music. Rather, it enriches by providing a link to the past that is grounded in the present. It embraces the fullness of human experience and potential. This interconnectedness may just be what saves and ultimately progresses a musical genre, providing a way to reach beyond self-imposed boundaries. I am honored and humbled that the editors at WordPress have chosen my blog post: The Power to Persuade. The Responsibility to Question. as a feature on the Freshly Pressed page. Thank you to all my readers—whoever, wherever, whenever you are! It is an honor to share my thoughts with you. The Power to Persuade. The Responsibility to Question. Music can inspire great achievements and launch a personal journey of discovery. Unfortunately, it can also be used to incite violence and promote an agenda of hatred. Like most people, I was shocked and saddened to hear of the recent shooting at a Sikh Temple in Wisconsin. As a musician, I am disturbed that the alleged gunman used music to further his extremist views. While upsetting, it also provides opportunity for focus and reflection. Evidently the gunman was in a band that promoted white supremacy and racial bigotry. While it is baffling that there is a market for such music, it’s even more troubling that some people blindly follow and assume the message is true. I do not listen to this type of music and certainly do not seek it out. That said, I’ve stumbled upon some rather alarming music videos by simply clicking a link or two. It’s not as far a journey as one might think. Music based on hatred has but one purpose. That intended message most likely cancels out any decency left in the actual notes, rhythms or beat. Music can be used for a multitude of purposes, from good to nefarious. This speaks to the power of music as symbol. Sound can be emblematic. Unfortunately, those who use music to support their disturbing views understand this clearly. The Nazis used the music of Wagner and Strauss in this way. And while Wagner certainly held unsavory political and racial views, it would be difficult to prove that his music led to Nazi extremism. Rather, since he dealt in the world of symbol and myth from a Germanic perspective, his music was more easily bent to their radical views. When music, great or otherwise, is presented this way the deeper message, the power of music’s greater potential, can be lost. But it is not only about music. I was disturbed to learn that the Celtic cross has been adopted as a symbol for certain hate groups. This beautiful cultural relic has no place in the culture of hatred. Rather, it belongs to the heritage of the entire world. Derived from the concept of axis mundi (world center), it represents a grounding valued by many cultures and faiths. Its decorative motifs can be seen in variations from Tibet to Ireland to the American Southwest. Today it represents a valid image for peaceful meditation regardless of religion. I have long admired Wagner’s music for the mythological images and personal message. I have also been fascinated by designs on Celtic crosses. I’ve read books on both Wagnerian and Celtic motifs from psychological, sociological, spiritual and cultural perspectives. When used for deep reflection, both teach me something about myself. While I am not part of either culture, the sounds and images instruct me nonetheless. For me, I choose to keep my Celtic pendant as well as my Wagner recordings. I continue to search and find meaning in that which inspires me—for the good. And I steadfastly refuse to allow uneducated extremists to hijack that which belongs to all humankind. I choose the side of music that has the power to lift us to the gods. Illustrations are images of a Sikh Khanda and Celtic Cross. Both have something to reveal. Thanks to Hans Zimmer, composer of the Batman: Dark Knight Rises soundtrack. This is the way to respond to tragedy. With healing. With music.